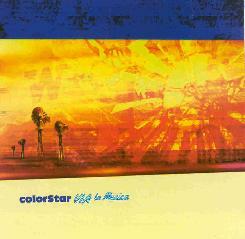 Colorstar - "Via La Musica"
This is the third release by the Hungarian band Colorstar and was recorded in 2000-01. This release continues more in line with the EP that was released in 1999, called 1.999. I was very impressed with the Heavennicetrip CD (reviewed by Keith H, if I am not mistaken) but that release was more hard while this is much more electronic. The band is basically a four piece with two guitars. The bass player, Pilu, arranges all the material and there are a lot of guest musicians on various synthesizers, violin, jews harp, percussion, etc. "Morning Call" starts off the CD and with its repeated bass line, reminds me a lot of Circle but the production is very clean and thin here. I had not really noticed it until now but some of the material here reminds me of some of the most recent Korai Öröm material, but less percussion and drums. This is probably because the band share one of the guitar players. "Budapest Win-a-trip" is a very electronic song with a cool groove. "Aalomadolom" is a fantastic nearly 10 minute track that really builds. "Waterfront" is a sort of psychedelic electronic dub reggae tune. This is an excellent release. If you like any of the Korai Öröm material and some electronica mixed in, for sure check this band out. Oh yeah... like most of the CDs released these days in Hungary, there is a video track you can play on your computer, along with pictures and a biography of the band. For more information you can visit the Colorstar web site at: http://www.colorstar.org. Email the band at: colorstar@index.hu.